Like many of you, I have become obsessed with the Netflix show Stranger Things. For those who haven’t jumped on the bandwagon yet, I’ll break it down for you. A group of pre-pubescent boys go on a mission looking for a member of their group who turns up missing. 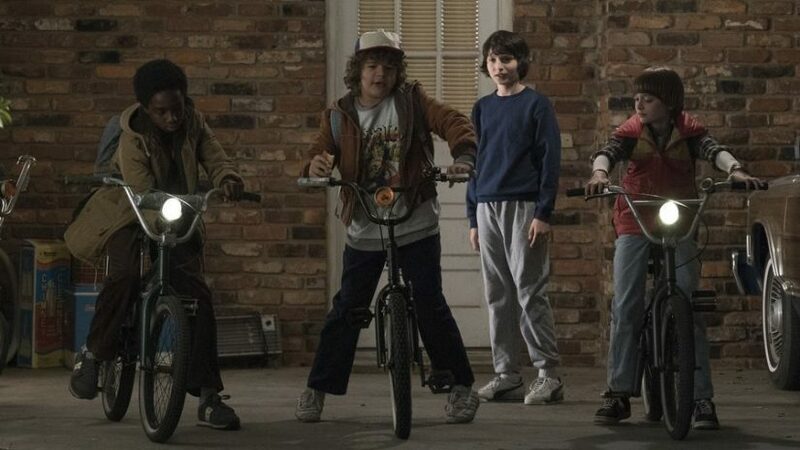 The first season of Stranger Things chronicles their quest to get their friend back who is trapped in another dimension. The show is set in 1983 and is crammed with dozens and dozens of references to 1980s television shows, movies and nostalgia. None are more prominent than E.T., which receives multiple tips of the hat throughout the series. From this point on, if you haven’t seen Stranger Things yet, the rest of the article will not make a lot of sense. For the sake of getting into spoiler territory, I strongly encourage those who haven’t watched the series to take an afternoon and binge watch it. The first season has only eight episodes. You’ll thank me later. Still here? Great. I am assuming you’re also a mega-fan. Welcome to the club. If you think about it, the story arc, queue, and ride layout for the E.T. 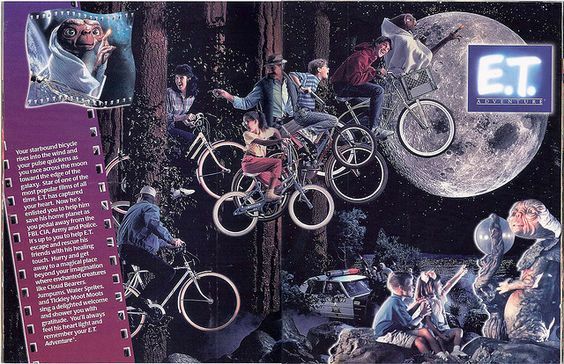 Adventure lend themselves to Stranger Things just as easily as it does E.T. 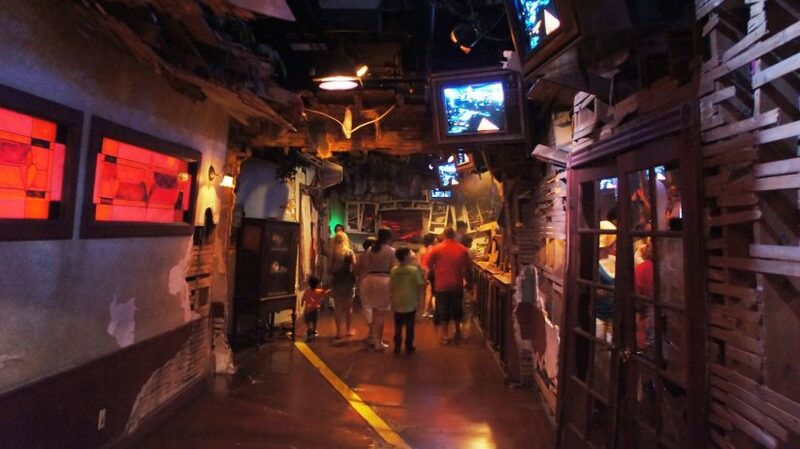 Here is an example of how the existing attraction can be re-purposed. The storyline I have created can exist just beyond season one’s finale. Since Universal likes to create original stories for their attractions, this also falls under that pretense. A pre-show room can be setup in the room of the house where Will lives. Think of something very similar to how the Twister pre-show was setup (too bad they sold off all their props! ), where you enter a kitchen, living room, and there are televisions set up. The ride attendant puts a VHS tape into a player which triggers the televisions around the room to come alive and play a pre-recorded message. Mike, Dustin and Lewis have filmed themselves at school searching for their science teacher Mr. Clarke, who has gone missing. They want us to bike over to the corner of Elm and Maple and meet them to help search for their teacher, as he was last seen near the woods where the other disappearances have occurred. We exit the family house and wander through the backyard under the night sky. Scattered throughout the yard is a box of Eggo waffles, a Dungeons and Dragons board game, abandoned walkie talkies and even a boom box that starts playing “Should I Stay or Should I Go?” at random intervals. In the distance we can hear vans driving around still searching for Eleven, who has yet to be captured by them. We board our bikes and take off on a steep hill and back down. On the other side we meet Mike, Dustin and Lewis who are wandering the woods on foot with their flashlights. They inform us that because the scientists think they know too much, they need to keep a low profile. We are encouraged to split up and look for their teacher as our bikes round the corner. In the distance, we can hear the sounds of a monster crunching through the leaves in the darkness and occasionally letting out a shrill screeching sound. We see a faint projection of a creature hunched over in the darkness and he suddenly turns around and heads into the darkness, but in the same direction our bikes are headed. As we round the corner, we see the three kids as they tell us that they think they have found their science teacher’s sweater just outside of a tree with a glowing red center around the corner. They ask us to check it out, but not to get too close to that tree. After another turn, we see his mangled sweater lying on the ground. At that moment, we are surrounded by white vans from the top secret science labs within the town. 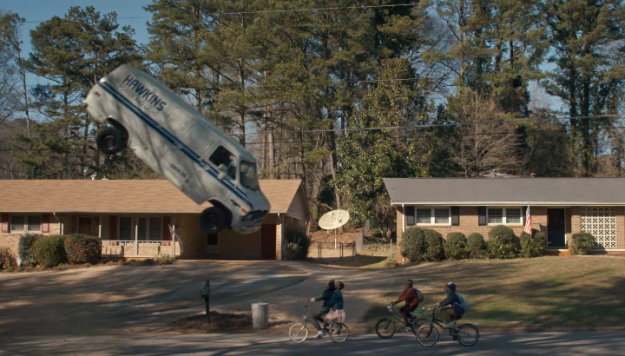 They instruct us to back away and at that moment, Eleven appears from the darkness and their vans flip over and away from our bikes as if by magic. 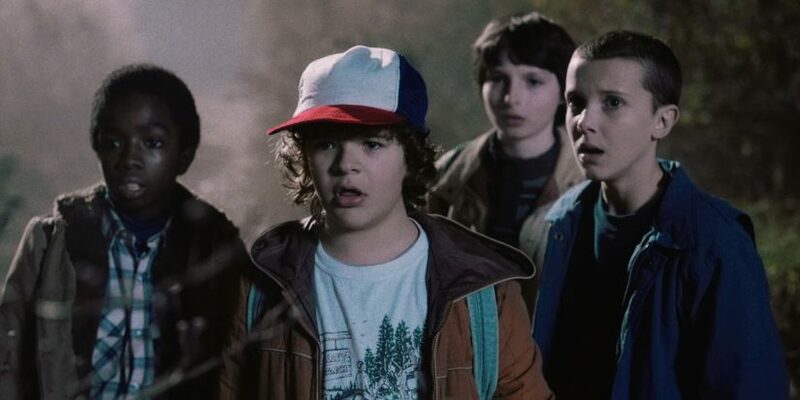 As we enter the tree into the upside down, we feel a thump on the front of our ride vehicles as Eleven’s head pops up from a compartment. 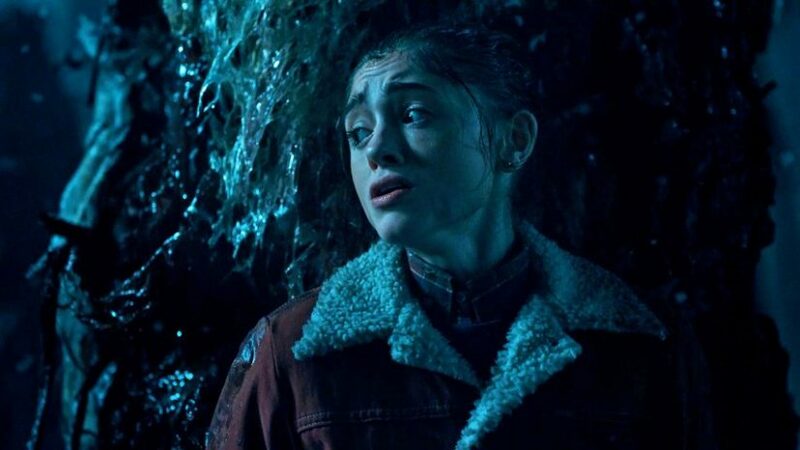 She has decided to hop on and protect us from the upside down and accompany us on our quest to find Mr. Clarke. In this version of the ride, E.T.’s home planet is replaced with the much more sinister upside down from Stranger Things. Gone are E.T.’s carefree alien cousins and creatures and in its place is a series of scenery from the show left in decay from Will’s hideout to the house we originally saw the pre-show video in. We can encounter new monster creatures yet unseen in Stranger Things and Eleven can help us bring Mr. Clarke back into our world. While the animatronics in the E.T. Adventure are charming, they have been outdated for decades now. Instead, this attraction could use a mixture of figures and Musion technology. For those unfamiliar, Musion was used to bring Frank Kinkade to life in the Disaster pre-show – a modern version of pepper’s ghost which allows Universal to film the actual actors from the show, which after all, is what makes it so great. Which leads us to why this will never happen. 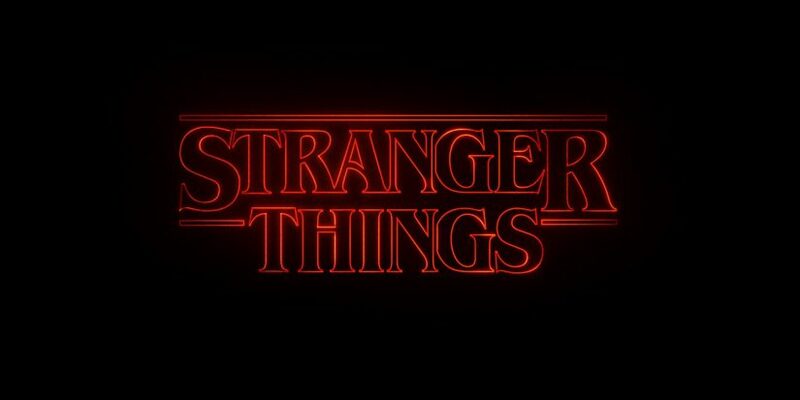 Unfortunately, Stranger Things is a Netflix show and is not owned by Universal. Despite many references to Steven Spielberg films, he was not actually involved with the directing or producing of this show, meaning Universal would have to license the rights. On top of that, you’re taking a fairly family-friendly attraction and turning it much more horror based. Which is actually closer to Universal’s branding than E.T. ever was. Now I know purists hope that the E.T. Adventure never goes away and they believe that most kids who ride it these days know who Elliot is and understand the reference to Reese’s Pieces in the queue, but that’s not the case. Again, this will never happen, but for fans of the show… surely you’ll agree that repurposing this attraction would be a killer way to see it in a theme park and no other park on the planet could do Stranger Things justice like Universal Orlando could. Your thoughts? Editor’s Note: Yes, I am aware that my story has plot holes in it. 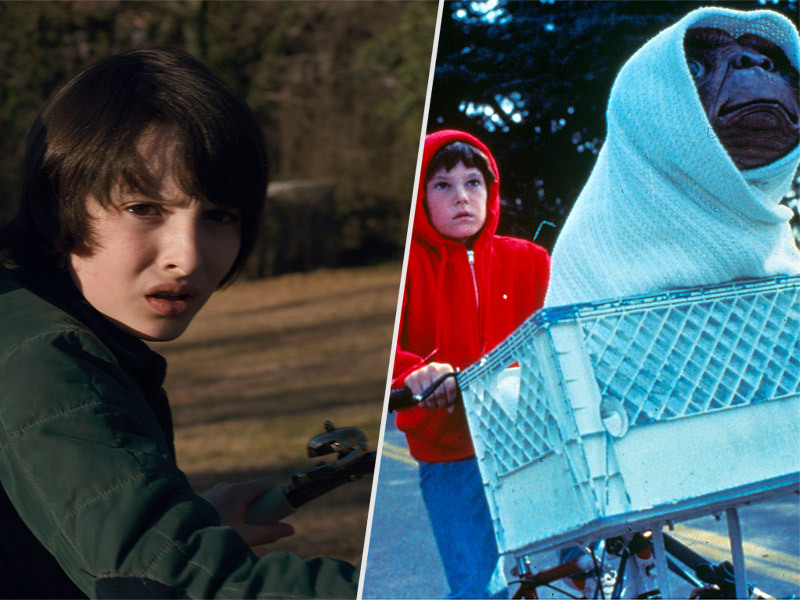 So does the series Stranger Things and frankly, so does the E.T. Adventure.The up and down motion of the ride vehicle doesn’t always match up with the story beats, but that could be ironed out if this were to ever become a reality. Theme park rides are notorious for not creating a complete narrative and this piece of fan work is no exception. 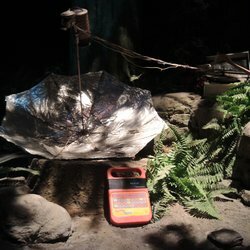 This entry was posted in Universal and tagged E.T. Adventure, Stranger Things, Universal Orlando. Bookmark the permalink. Trackbacks are closed, but you can post a comment. How dare you suggest such a stupid, stupid idea, Josh Young! You know this will never happen. And you should also be ashamed of yourself for being completely wrong about E.T. Adventure–it’s a fantastic ride and still a guest favorite. Plus Spielberg won’t allow it to be removed–if it happened, he’d throw a hissy fit and cut his ties with Universal. Plus the same contract that prohibits E.T.’s closure also applies to the Jurassic Park section of Islands of Adventure. And there’s also the fact that E.T. Adventure is located in Woody Woodpecker’s Kidzone, an area for kid-friendly rides like E.T., so don’t even think about it.